Eat great during your trip and experience the diversity of Southern California’s culinary scene. 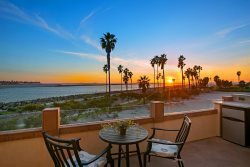 Check out our favorite local picks and recommendations for restaurants, cafés, taverns and places to eat in San Diego located just a short drive from your vacation rental. Choose from a variety of dining options in downtown San Diego, the Gaslamp Quarter, Seaport Village, Little Italy, Liberty Station and Old Town offering dishes ranging from fried chicken to sushi. Inspired by the original Union Kitchen & Tap in Encinitas, the Gaslamp Union brings a refined, yet rustic style to the heart of the flourishing Gaslamp Quarter. Generous patio seating connects a lively indoor vibe with refreshing outdoor spaces, setting the stage for the enjoyment of New American food, local craft beers, vintage wines and hand-crafted cocktails. The restaurant also offers late-night dining and nightlife featuring live music and local DJs. Bluewater guests receive 20% off food with proof of rental. Cuba has landed in San Diego’s Gaslamp Quarter. Located just south of Market Street, Havana 1920 brings Hemingway’s Cuba to life with authentic Cuban dishes, drinks and entertainment. Choose from an extensive menu of traditional Cuban entrées, tapas-style small bites, espresso drinks, desserts and more. Enjoy live music Tuesday through Saturday evenings. Located on Harbor Island, Coasterra features fine oceanfront dining with a menu of innovative and modern Mexican cuisine. Take in incredible skyline and bay views as you dine on seafood and steak entrées outside on the patio. For the complete experience, pair your meal with a hand-crafted drink featuring agave spirits. With its headquarters in downtown San Diego near Seaport Village, Puesto is a hotspot for sharable plates, amazing margaritas and award-winning tacos made with fresh ingredients. The restaurant resides in the former San Diego Police Headquarters building and showcases modern murals from the artist Chor Boogie. Ask about their taco and margarita of the month. Situated near Broadway Pier, Carnitas’ Snack Shack Embarcadero features panoramic views of San Diego Harbor, the USS Midway and passing ships. The Snack Shack serves up thoughtfully sourced, pork-centric American cuisine in a fun, no-fuss environment. Satisfy your hunger with tasty sandwiches, tacos, salads and sides. Taste the difference at The Crack Shack and savor cage-free, locally raised chicken just as nature intended. Bring the whole family and dine on fried chicken and egg fare reimagined in the sunny Southern California spirit of inspired cuisine and spacious ambiance. In addition, sip craft drinks or compete in lawn games. “Pig” out on build-your-own meatball sandwiches and old-fashioned soda fountain favorites like craft sodas, milkshakes, floats and sundaes. Other menu items include burgers, sandwiches, pasta, salads and specialty sides. Please everyone in your family or group – from picky eaters to adventurous foodies – at Liberty Public Market. Located in an old Navy building, the public market features more than 30 eateries along with bars, test kitchens, artisan craft vendors, live music and special events. Market cafés serve up sandwiches, barbecue, pizza, pasta, salads, seafood, ethnic cuisine, desserts and much more. Located in the heart of South Park, Station Tavern provides fresh and delicious comfort food, burgers, sandwiches, a rotating selection of craft beers and a full bar. Its large family-friendly backyard features picnic table dining and a play area with chalkboards and a half-scale trolley. Serving authentic Mexican food since 1977, Old Town Mexican Café is a San Diego staple. Their handmade tortillas have been proclaimed “the best in the world” by satisfied diners for decades. Popular items include the Carnitas Plate, molcajete served in a traditional stone, carne asada, street tacos and pozole. Don’t miss happy hour with drink specials and half-priced appetizers, Monday–Friday, 3–6 p.m. and 10 p.m.–close. Considered an off-the-beaten-path spot by San Diegans in Old Town, award-winning Harney Sushi offers more than 30 varieties of specialty sushi rolls and dishes along with creative cocktails in an energetic atmosphere. Each dish is made from purely natural, sustainable ingredients and products. A gluten-free menu is available. Listen to live music on select nights. Bring It To Me coordinates takeout delivery from the San Diego area’s most popular restaurants right to your Bluewater vacation rental. As a guest of Bluewater, use promo code BLUEWATERSD for 10% off. Enjoy gourmet meals in your vacation rental prepared by a personal chef. For help planning your vacation, contact us at [email protected].